Parents, we know how hard it can be to find safe and affordable products to use on or around your baby or young children. The Honest Co is the answer to many parents’ problems because they have created baby-friendly supplies. If you have never made a purchase from The Honest Co, now is a great time to start! Why? Because they are currently offering an incredible deal that we want to tell you about. For a limited time, you can get 40% off your first Honest Co bundle when you use the discount code EXTRA40 at check out. This is an amazing deal because you will save 40% on top of the 35% in savings you receive just for purchasing the products in your bundle (aka in bulk price)! 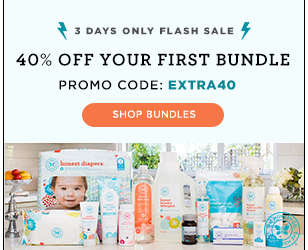 There are several Honest Co bundles to choose from including a diaper bundle, an essentials bundle, a formula bundle, and a health and wellness bundle! Select the bundle that best suits your family’s needs. Many of these bundles allow you to mix and match and add or remove items that you may or may not need. This incredible savings opportunity will not likely stick around for very long, so take advantage of it while you can!